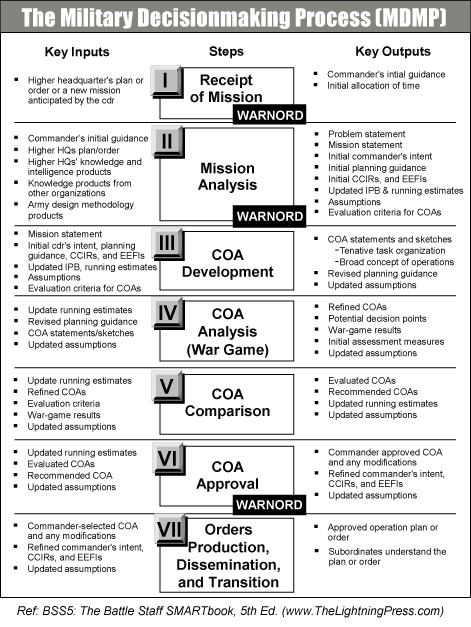 The military decisionmaking process (MDMP) is an iterative planning methodology to understand the situation and mission develop a course of action, and produce an operation plan or order. The military decision making process helps leaders apply thoroughness, clarity, sound judgment, logic, and professional knowledge to understand situations, develop options to solve problems, and reach decisions. This process helps commanders, staffs, and others think critically and creatively while planning.